ASEAN-Japan Centre conducted a school-visit to Oidaiichi Elementary School. 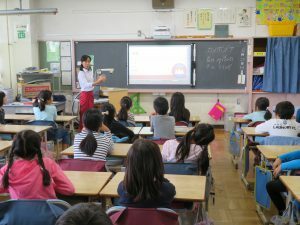 In the school-visit program, Cambodian, Indonesian, Myanmarese, and Filipino nationals living in Japan introduced their home countries to the 3rd grade students. 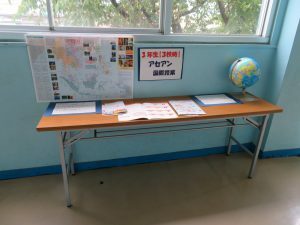 The school set a table in the hall way and placed information materials on the ASEAN Member States that had been sent from AJC; and made students to study on the Member States of ASEAN, their locations and people living in the countries, among others, by themselves. On the day of the lecture, students chose the country that they want to learn more about. During the Q/A session, the topics on sports, animals, and the languages of ASEAN Member States were frequently asked.